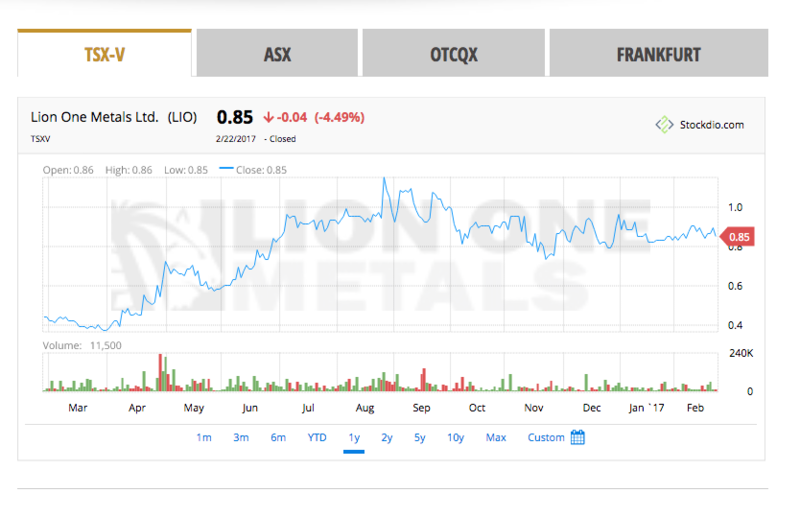 Lion One Metals is a Mining Company that has been up and running since 2010. 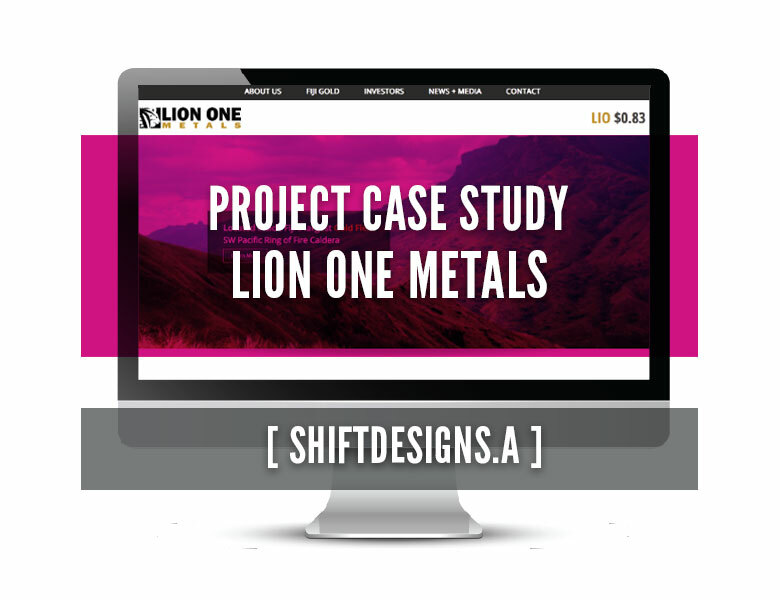 Prior to meeting with them, Lion One was on their 2nd variation of their website. This round was developed & hosted with what I call a ‘default provider’. I say this partly because I’m not here to bash the previous developer and that because this like others in this field was a provider that focused on a specific industry and offer packages to the clients as a one-stop shop. The client can get hosting, design, development, maintenance, newsletter and digital marketing in one place all for the easy cost of 1 payment per month. While this may be a marketing marvel for the provider as a business, I find these kinds of providers the least satisfactory for clients. Lion One is on the smaller side employee wise so there is no dedicated marketing department. What companies like this provider do, is provide an easy way for them to choose which way to set up their marketing in addition to it being an industry standard. However, things like innovation, design & customer service lack. The biggest score for these providers is gaining the contract and once that has happened the attention drops off. This was how Lion One felt. In fact, by the time they came to me, they had a laundry list of things that they were unhappy with & wanted to change. The following were outstanding issues they were frustrated with and what the final results were when I completed the project. The Prior version of the website left something to be desired. It was revealed to me, they had mocked up a design using power point to show the provider as a way to inspire & showcase what they would like to see in the layout. The provider proving to have no imagination took that layout & copied it exactly. So the company was desperate to have an overhaul. The approach to this website was to both lighten up the current look and to refine the design so as to increase the overall professional look. One integral component I thought was lacking was photography & the first thing I suggest was compiling a library as photos not only illustrate messaging but they add spikes of colour to help create a warm & engaging page as this site leans towards being too text heavy otherwise. Lastly we didn’t stray too far away from the brand colours. I reviewed the logo and took leniency by converting the logo’s existing silver into gold to reflect the type of mine they were. Additionally, the gold is a warmer hue then the silver and when used against something like black it helps create a more inviting page. Silver is best used alongside other bright colours or as a secondary colour rather than being the prominent fixture. Furthermore, the use of black in large quantities like the footer was too severe. I reduced the impact by choosing a more moot version & picking charcoal. (Again there is a serendipitous double meaning with charcoal). The black appeared what I like to call too ‘cut & paste’* whereas the charcoal, a softer hue, is a colour that is chosen. It helps elevate the design rather than take away. As the inside pages are very text heavy I wanted to book end the pages with photos. 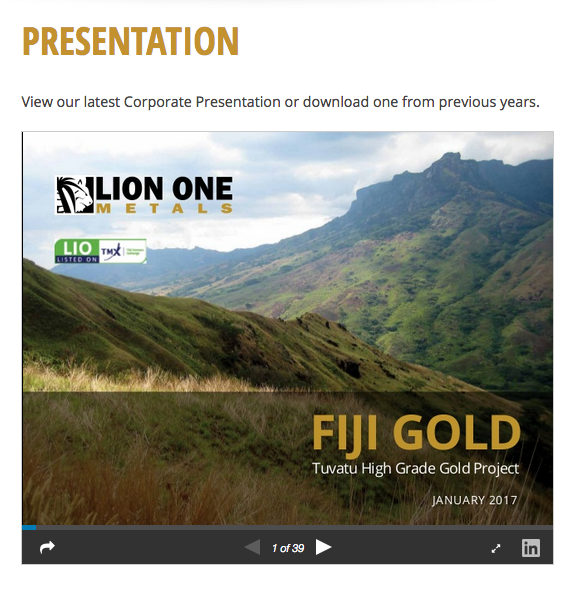 At the top the banner acts as a reinforcement to the section we are in (ie: The investors section is an economic graph), and the bottom are visual link buttons to the most important pages: Fiji Gold, Latest Presentation and the Latest News. 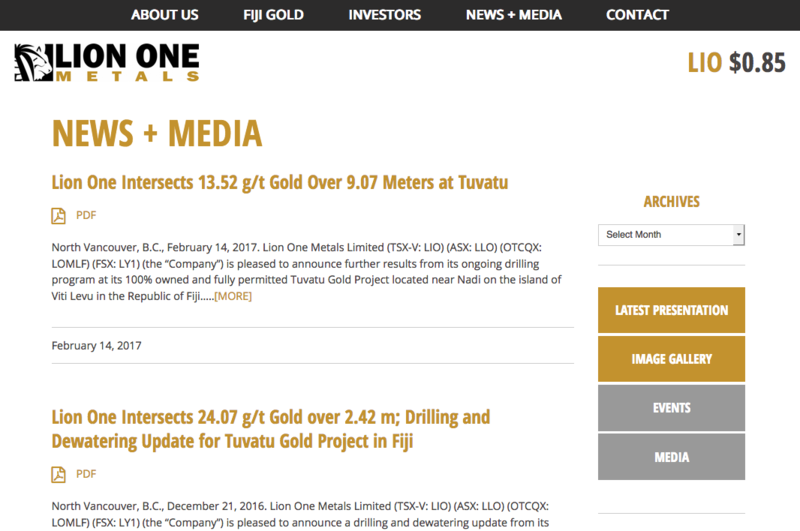 (With the exception being the Fiji Gold section, that link would go to Investors). These 3 calls to action are what the readers seek out the most often. The intention behind keeping these calls to action in the front is to a: drive home what the company is about but also to make it easy for the reader to gain what they need. Lastly, I utilized WordPress Features whenever possible. We could have plopped text in page after page and just be giant blocks of content however, using dynamic features keeps the reader engaged and we don’t want any interested parties leaving the site. Their old site showed several quotes across the top, which they didn’t need. They were listed on 4 exchanges but their main one was the TSX and that was the quote they wanted to focus on. As well, the price of gold was listed & that wasn’t necessary. 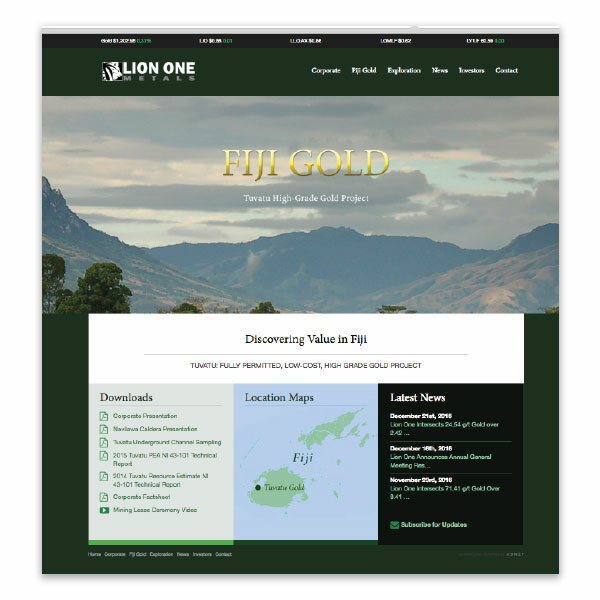 Lion One may be listed on 4 exchanges but it is not imperative that they show the 4 symbols across the header nor is it important to show the price of gold (at least when you first arrive at the site). Related to the stock quote are the stock price charts. Lion One felt the ones they used were generic and not attractive. In order to simplify, they wanted 1 symbol, which is the TSX. However, we do need to showcase the remaining exchanges. So we displayed that information under the stock info page along with the charts, which was another item up for review. Lion One was seeking a more attractive display and one that could incorporate some branding and we did just that. We found a plugin that would allow for some customization and I hate plopping information 1 after the other so instead, I opted for a tabbed approach. This works great in both the main screen and on mobile. The information is tight and all at the top of the page. They posted their news releases online in a list format. While you were able to access past years through a tab. As well, the page didn’t show much more than the list & the viewer interaction was low. As we were updating the site, they wanted a more modern look to the news release section as it is one of the most important parts of the website. As we were moving the site into WordPress, I thought it was best to utilize the blog feature of this architecture and move all of the news releases into a post format. We built a feature at the end of each post in the back end so that the user can easily attach the corresponding hard copy pdf to the release. This is both easy for the user plus is displayed very tidy in a consistent manner. Moving into the blog also enables a few things such as the search feature. It is sophisticated & allows the viewer to easily find an article. As well, we are able to categorize the posts. 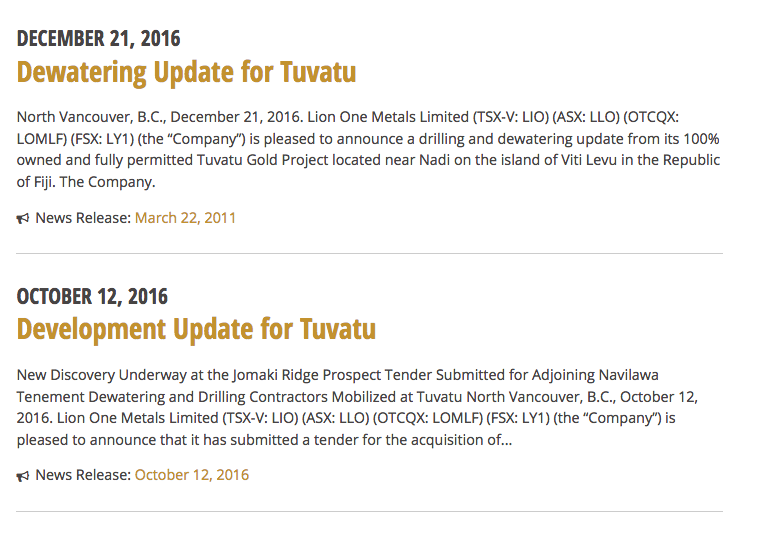 It shouldn’t have to be mentioned that the design aspect of a blog is a great way to display the news releases. Whereas they were listed in rows by years before, a blog format gives the reader a snipped of what the post is about and the page as a whole lets us utilize the side bar function to display archives, categories in addition to pushing the subscription + twitter feed. The last iteration of the website had the subscription feature placed on one page. One had to dig to be able to sign up for Lion One Alerts. In this round, we wanted the subscription feature to be front & center. This version eliminates the need to hunt for anything. Increasing subscriptions is an initiative they want to foster, therefore, we placed the subscription feature front & center on every page. While that may seem aggressive, we do not want the reader to get excited about what they are reading and then we lose that momentum. Having it as a call to action after every page is a simple way to capture more leads. The subscription leads itself into the email aspect of their business. With their old provider, the email distribution was part of their package. Their biggest grievance was that no analytics were provided. They had no idea how many people opened their emails, clicked links or even if they bounced. This is important information. By seeing who read the emails & clicked through, they could create a marketing funnel to follow up with interested parties and foster better relationships. We moved them into Mail Chimp. I was tossing around between using Mail Chimp or Constant Contact and ultimately landing on MC because 1: I am more familiar with the program (I have used it for my campaigns) and 2: They have an additional app for ipads that enables people to subscribe from a desktop screen which is great at conferences. So we took them away from the provider & put them in third party software. Not only do we have access to analytics but we are also to create many subscriber lists based on geographic location/where acquired and be able to create lists based on what information the subscriber is interested in receiving (mining updates vs financial updates etc.). Another feature we were able to tap into is the automated reply. Previously, investor relations had to manually add people to their list, and welcome them to their list. Who does this anymore?? If it isn’t automated, then you are stuck in 2007 not in the present. We are not only able to qualify the subscriber as they sign up but we are able to create a work flow that upon subscribing are welcomed within minutes with a copy of the latest corporate presentation. While those were the most needed fixes on the site, there a few other things on the site that I felt could be finessed and refined. The accordion is a feature on websites that allows the content to still be displayed in a list format but makes you able to hid non-essential information. 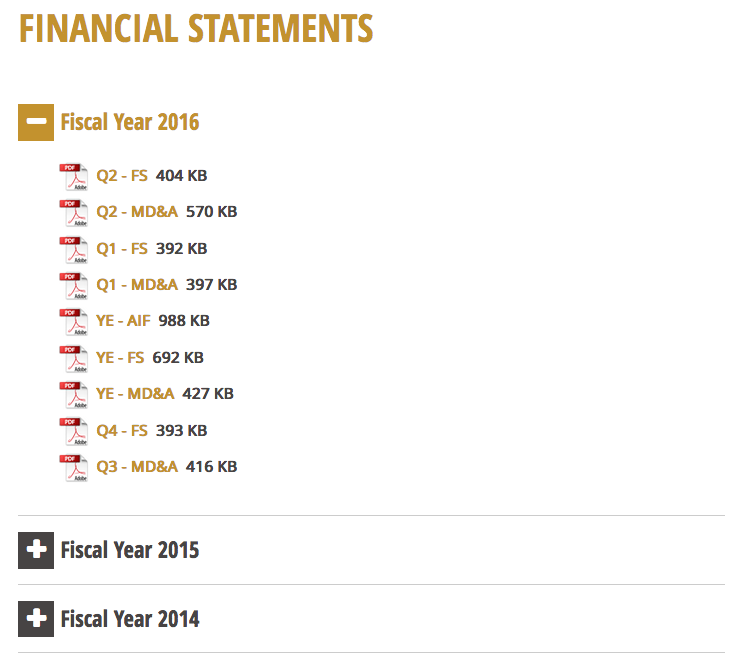 This was great for pages that showcase a lot of past downloads like the Financial Statements & Corporate Presentation. Speaking of Corporate Presentations, the only way you could review one was to download the 40-page document. While we still want the viewer the versatility to download, we are also missing the boat by not adding a visual presentation to the page. So we tapped into Slideshare off of linked in where we can upload all past presentations (this also allows a company to showcase said presentations on their linked in company page). Slideshare gives you an embed code so you can stream direct onto your site. So we did just that. They say a picture is worth 1000 words, then a presentation is worth 1000000. On pages like development, a history timeline is important to show how we got to where we are. Rather than recreate tons & tons of content that already exists. Why not link to it? 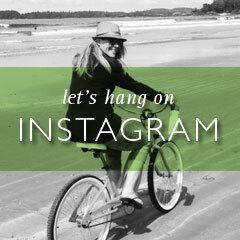 Yes, we built a back end system to post site friendly links + their downloads. This created a tidy way to present the timeline and consistency of presentation across the website. Last but not least there were a few offline items we needed to review like the Corporate Presentation and create a Fact Sheet. Those Results are also below. If you like my results.. contact me to see how we can starting working together today!